Did you know there are 5 types of Psalms? Me neither. The entire Psalter may be treated in a five-fold fashion, that is, we may divide it into five groups. FIRST, some Psalms prophesy. They speak, for example, of Christ and the Church or what will happen to the saints. This class includes all the psalms that contain promises and warnings -- promises for the godly and warnings for the ungodly. SECOND, there are psalms of instruction, which teach us what we should do and what we should avoid, in accordance with the Law of God. This class includes all the psalms that condemn human doctrines and praise the Word of God. THIRD, there are psalms of comfort, which strengthen and comfort the saints in their troubles and sorrows but rebuke and terrify the tyrants. This class includes all the psalms that comfort, exhort, stimulate endurance, or rebuke the tyrants. FOURTH, are the psalms of prayer, in which we call on God, praying in all kinds of distress. To this class belong all the psalms that lament or mourn or cry out against our foes. FIFTH, are the psalms of thanks, in which God is praised and glorified for all His blessings and help. This class includes all the psalms that praise God for His works. These are the psalms of the first rank, and for their sake the Psalter was created; therefore it is called in Hebrew Sefer Tehillim, that is, a praise book or book of thanksgiving. We should understand that the psalms, with all their verses, cannot always be classified so precisely and exactly into these groups. At times one psalm might contain two, three, or even all five classifications, so that one psalm may belong in all five divisions, with prophecy, instruction, comfort, prayer, and thanksgiving lying next to one another. However, it is the intention that the reader may understand that the Psalter deals with these five topics. The classifications are a help, so that we might more easily understand the Psalter, become adapted to it, and also be able to learn and keep it. What a refreshing perspective particularly when I've been so used to reading the Psalms as a "To Do List" or as "A Prescription For Godly Living" -- which, in a sense, they certainly are -- except I was always removing Christ from the picture completely for some reason and making them all about me. Now, please don't misunderstand me, as mentioned, it is sort of "A Prescription For Godly Living" as Luther's commentary clearly suggests, but not in the ways so commonly believed, taught, and confessed by many within contemporary Christianity today. I like to think of it in the way that I heard Pastor Wolfmueller once describe it: For instance, any time we come across the word "righteousness" in the psalms, we need to immediately think of it from a Gospel perspective (as in believing and confessing what Christ did and does for us) and never from a moralistic, works righteousness perspective (as in what we have done and can do for ourselves) as so many often want to. 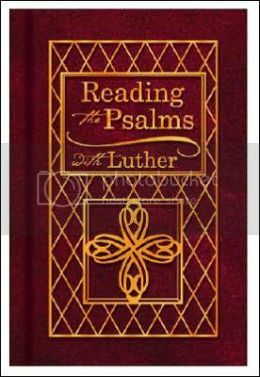 In a Lutheran layman's terms, I'm thrilled to have gotten my hands on this little book to help me start reading the psalms properly from now on.